All models in the new CT-X line are equipped with the new AiX Sound Source, which authentically reproduces the characteristic sounds of acoustic instruments. They have everything you need to let your creativity run wild. The Casio High-Grade keyboard series provides a user-friendly experimental field for committed sound design and recording songs. Discover, experience and learn new things every day: Versatile CASIO standard keyboards are the perfect way to discover the joy of making music! The CASIO Lighted Key technology provides learners with the option of independent learning and musical achievements. You will see how anxieties about playing music are reduced and turned into a joy of playing! Stylish design, small keys, sound diversity and exciting features to make music even more fun. CASIO Mini keyboards unlock the joy of playing for young and old alike! Whole generations of musicians have already shown off their abilities and creativity on CASIO keyboards. Through their high sound quality and sophisticated technology, the electronic keyed instruments offer many ways to be used, making CASIO keyboards the standard equipment for musicians of all genres for years. Their unmistakable sound, their fullness of sound and rhythm, and their easy usability delight both amateur and professional musicians equally. Here at CASIO Music, you can find out about the various electronic keyboards from CASIO, in order to find the right instrument for your needs. Learn about the preferences and options of our various keyboard types. No matter whether you would like to get a CASIO Standard Keyboard or are looking for multifunctional arranger workstations, CASIO illuminated display keyboards, or one of the CASIO high-grade keyboards - here you will find out everything about technology and the details that distinguish CASIO electronic keyboards. The integrated retailer search will show you where you can receive a professional consultation and a demonstration of CASIO keyboards. 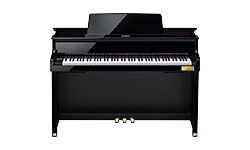 While CASIO gives particular attention to a combination of high sound quality, modern functions and excellent optics when it comes to its pianos, CASIO keyboards really excel in their compact format and immense flexibility, paired with an incomparable variety of functions. Whether at home on an integrated speaker, used with headphones, or on stage, CASIO keyboards will impress musicians whatever they are using them for. With its current array of CASIO keyboards, CASIO Music covers all possible demands. Whether for beginners who want to take their first steps on a keyed instrument, ambitious musicians and entertainers who rely on their instrument for family events and parties, to experienced professional musicians, CASIO keyboards are perfect, reliable companions. Composers and arrangers also choose electronic keyboards that can be easily transported, flexibly used, and have a wide range of programming and editing functions. Through this, musical ideas can easily be realized and recorded, and thanks to integrated recording options, without costly studio equipment. What Makes CASIO Keyboards Different? Unlike electronic pianos or digital pianos, which have a classic set of 88 keys, keyboards have 49, 61, or 76 keys. The usual hammer action used for pianos is avoided, so that the keys are especially smooth as on an organ or synthesiser. This makes the keyboards from CASIO different. They unique combine a perfect aesthetic with functionality and proven technology. In developing CASIO keyboards, the years of experience in developing them takes effect. Keyboards from CASIO are extremely light and therefore transportable, and can be used anywhere. There is a substantial variety of sound, as well as countless effects. Colour LCD displays and keyboard expression pads make using it especially comfortable. The various sounds and programs can be easily switched on via key combinations and controllers on a well-structured surface. 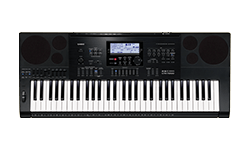 While CASIO caters particularly to advanced and creative professional musicians with its high-grade and arranger keyboards, the standard and illuminated keys keyboards are better suited for beginners and advanced. CASIO light display keyboards have a visual learning system, that is based on the latest findings in music pedagogy. Modern practice systems like Step-Up Lesson and Lesson Lite, or functions like Music Challenge will motivate the learner to practise and play. Come and take a look at your local retailer and be impressed by of all the possibilities that CASIO keyboards can offer you.